An introduction from host Jeffrey Mosser on what this podcast plans to address: how do ensemble-based and collaboratively-created theatre companies make and pay for the art? And just what does “Ensemble” mean? Jeffrey Moser: Dear artists, hello. I am so glad you are joining me on this adventure. I want to tell you so much: what I've learned from the podcasts, what you're about to hear. But what I think is great about these is that I hope that folks are able to listen, and take away things for yourself. We're all in the midst of connecting dots in our lives and in our artistic processes, and we're just not all on the same dot right now. So I hope that what you're about to listen to—the series that you're about to listen to—helps you go get to your next dot, and maybe think about where the next dots are. This podcast is going to be a couple of different things. First, it's going to explore how you make and pay for the art. Hold on, wait a second, let's break that down a bit already. Let's just take it for the first part. Make. By "make," sometimes I will get into the nitty gritty of an artistic process with the artists I speak to. But I will also often be asking about how they get the right artists in the room. Which is a big thing in and of itself, because when you start an ensemble, what I've encountered—and this is a blanket experience—they begin with this idea of an egalitarian style of work, that all people are going to pitch in, we're all going to do the same amount of work, and we are all going to be artists and create something with this goal in mind: to make the art. We want to make the art that we want to make, we want to make the art that isn't seen, we want to make the art for the voice that isn't on stage. But as egalitarian as those ensembles are, and as they continue, what I notice is that throughout all the interviews I share and with the companies that I know well enough but I haven't interviewed yet, is that from this egalitarian style, is that many of the artists say, "I don't think I want to do that anymore. I don't want to do marketing anymore, I don't want to write the grants anymore." What we start realizing is that there are people who are maybe more excited to, more apt to, more interested in doing the administrative side of things. So the artists start to peel themselves away from these things. Or maybe they start to glom on to them even tighter, like they say "I really want to do the education arm of this work," and they connect themselves to that, which is a really fascinating thing to me. So where does that leave us, right? Hopefully the gap between those two worlds is what we are going to explore. How do we find a way to continue to make art? And how do we find a way to pay for it? I'm going to talk about paying for it a little bit more in a second here, as well. The other thing this podcast is asking is "what does it mean to be an ensemble?" You ask five different ensembles what "ensemble" means to them, and you will get five different answers. None of them are wrong, none of them are bad. All of them are exactly what ensemble means to that person and to their organization. If ensemble-based and collaboratively creating theatre is trying to break from the norm, or even create a new norm, then there just can't be a wrong way to have an ensemble. A big goal of this podcast is to get that collective idea of what "ensemble" means. What does it mean to that group in particular? It's much more interesting to me personally. "Ensemble" could mean a decision-making process, it could mean equality, it could mean unification around an artistic idea, being dedicated to a process or a topic, anything. Let me back this idea of ensemble up a bit. I remember Michael wrote at some point telling me that "every new ensemble is an attempt at a perfect society." And someone saying, "We have the formula for utopia. Let's try it." And that attempt that is always worthy, because we can always be striving for a better society. The more I talk to folks about how their process is, despite their best efforts to talk about how they keep it as egalitarian or flat as possible, you still have to pay for the art. That is just a fact of the capitalist society in which we live. Now would be a great time for me to say that I'm likely going to make a lot of blanket statements about capitalists and hierarchical structures, because that is how funding and wealth giving is understood in our country, and it's just the nature of the game at this point in time. For example, regional theatre models have a board of directors. In fact, a benchmark for many small theatrical organizations to become a nonprofit is to have a board of directors. Your board helps you get the support that you need in order to grow, and this is an amazing thing. They know where to help you to look, and the board of directors is a model that comes from the for-profit world. So it's even here that we see the trickle down of the idea of hierarchical structures into that utopian society, into that nonprofit world. Will that board allow them to work autonomously? These boards are there for financial benefit of the organization. They care a great deal for that organization, and are there to help. Grant boards are also committees dedicated to seeing their money go to work, or the parent organization’s funds go to work. They make judgements about "is this work fruitful? Will it regard something? Will it create something by the end? Will this work lead to something? And how can you as an ensemble, who may be collaboratively creating, who may be devising something from nothing, prove that what you are going to make is going to be of merit?" The question herein is very difficult to prove when you may not have much else other than the title of the play that you are potentially working on. How do you prove yourselves worthy of making the art? And that begs the question of who is worthy of making the art? But we don't have time for that question today. But getting money and trying to make something that has an unknown outcome feels like a huge leap into the unknown for the creators and for the grant boards, and it is. Let's say that you do have a track record, and let's say yes, you are applying for a grant. So now it's about proving how you're going to break through a threshold of knowledge. [T]he more that ensembles can break through this capitalist structure of grant boards, and the more grant boards can understand that there are processes that don't look like a typical hierarchal structure, the more we can breathe into those non-traditional art making models. So in your proposal, you're working through all these different ideas of what the final product might be and how you're going to break through to that new, big idea. What is going to be the end result? What do you hope to accomplish? You know who else doesn't know what the outcome is going to be when they do grant-phased work? Research scientists. "I would like to study the potential links between heart disease and childhood cancer." How do you say, "I think there's a connection there, I'd like to pursue it. I have a question about it, and I don't actually know if it will work out, please let me spend your money, institution, grant board, medical school, etc. I have to try this in order for us to know, and if we find out and we know it will give us greater understanding, we will surpass a knowledge threshold." And the other thing is the more that ensembles can break through this capitalist structure of grant boards, and the more grant boards can understand that there are processes that don't look like a typical hierarchical structure, the more we can breathe into those non-traditional art making models. Those realms can really start to take off and start to do more than just survive—they can thrive. Those are the big things of what this whole podcast is aiming to talk about. There's one other big idea I want us to be thinking about in the back of our heads, and something that I am constantly thinking about when I look at theatre across our country, and how it's made and how we support one another, and how theatres actually support one another. I am seeing how theatre is one big old tent, and there are many rings to that circus. One ring is the regional theatre system, one ring is the storefront fringe theatre market that might be using sort of a similar seasonal structure kind of thing. One of those rings is ensemble-based work, one of them is commercial work, one of them is performance art, theatre, different podcasts…Sorry, long story short, what I think we are missing in those first three rings—the regional, the fringe/local, and the ensemble based work—wherever they might be, in whatever region they are, I think they have a lot to gain from each other, because they are telling stories of and for their communities. Thinking about theatre as the unknown, as the search for the unknown, as theatre as research into the human emotion, into empathy, right? The large or small theatre is attempting to find it through new plays by new playwrights, or through new lenses on classics like Oklahoma or Shakespeare, which is great. For example, if you've gotten a chance to see Ivo van Hove's View From the Bridge, that's a spectacular artistic lens through which to look at a classic script. It has found a way to speak to a new audience in our zeitgeist. It also tells a story, and boils it down to a human emotion. That is research and adaptation, you know? It's those thresholds of an existing script, and what happens if we do it this way? Will we find a link? And yes, I think there are links that were found in that play in particular, and throughout new versions of classics. Which is all to say, I'm not saying theatre has to be experimental like this, or it has to be a spectacle or research only. But I think that those first three rings have a lot to learn from one another. When it comes to making and paying for the art, I think that there is a way for them to reciprocate with one another. I think that regional theatres can find and give homes to those ensemble-based and small theatres, and recognize when exceptional storytelling is happening, and give a home for those opportunities. That is our job as theatre artists, is to point our audiences to those exceptional things; the things that make us more human. So how can ensembles be asking for a piece of the pie, when the cards feel like they're already being stacked against them, in terms of funding models? How can you continue to make the art that challenges you, when the art costs more and more to explore? But again I'm going to say, capitalism, we are ultimately making a product, and we have to work on something that we think is going to be successful. I have my own territory and space, and the person with the most grand funding wins, and that's not true. But it feels like it sometimes, doesn't it? So how can ensembles be asking for a piece of the pie when the cards feel like they're already being stacked against them in terms of funding models? How can you continue to make the art that challenges you when the art costs more and more to explore? If there is anything that I've said here in the last fifteen minutes, a question, a concern, or idea that you wonder about, this podcast is for you, because I have been thinking about these things too. I've had interviews with theatre professionals from across the country, from Chicago storefronts, to Pig Iron in Philadelphia, and Dell'Arte in Blue Lake, to get down to the idea of how they make and pay for their art. It has been so fantastic doing so, because I, as a theatremaker, indulge in learning how people make what they make. However, this won't be all on one side of the table. I'm also asking non-theatrical folks how they get grant funding, as well as interviewing grant panels, and those who are especially known for funding ensemble specific projects. So, this is going to be a search. A search to understand how we can be better, how we can fund these processes better. And how we as ensembles and individual artists can break through some knowledge thresholds. So, let's break through some thresholds. 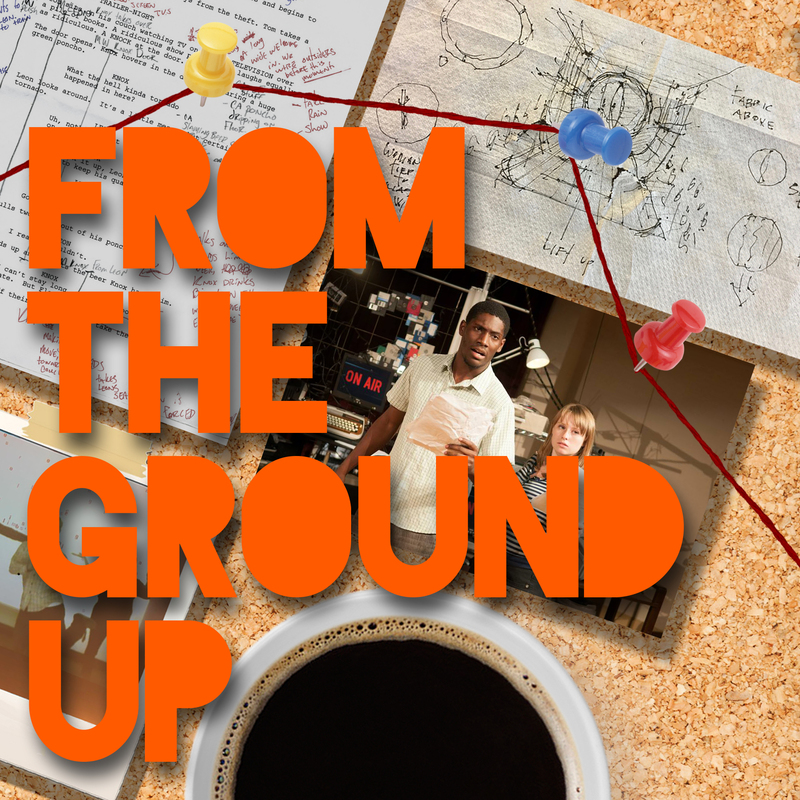 From The Ground Up is supported by HowlRound, a free and open platform for theatremakers worldwide. It's available on iTunes, Google Play, and HowlRound.com.